Alfonso Pardiñas (pictured here in the 1950s) was at the center of San Francisco's Bohemian scene from the mid-1950s into the 1970s. 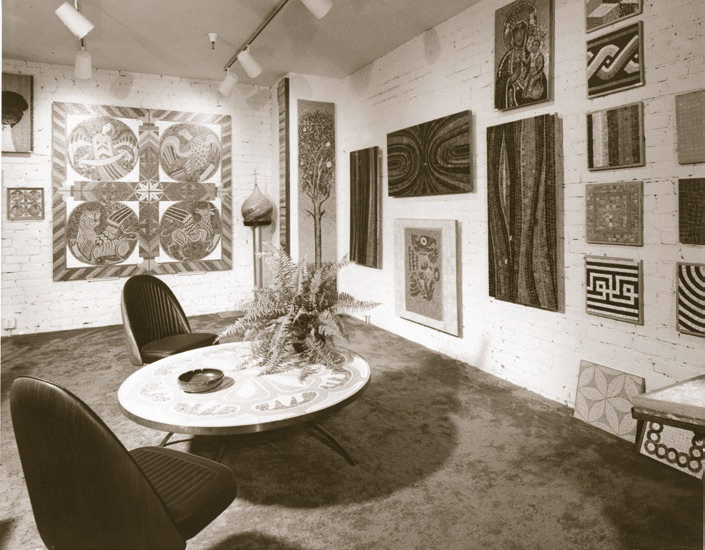 Byzantine Mosaics' Ice House showroom at S.F. 's Embarcadero. 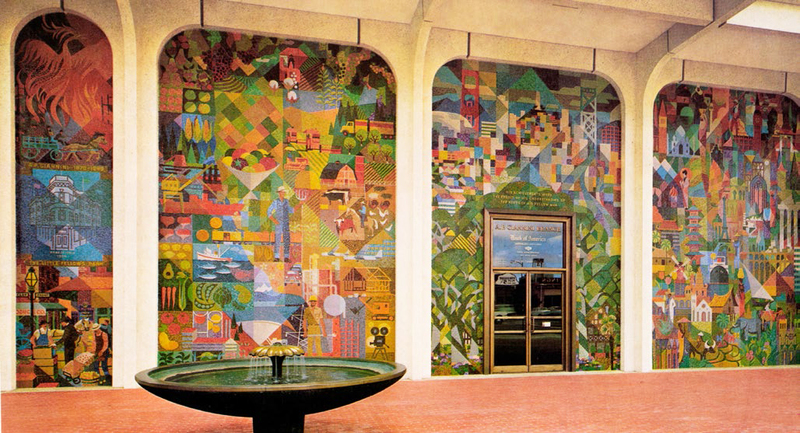 Mosaic installation Pardiñas contributed to for Bank of America: an immense mural designed by artist Louis Macouillard at Third Avenue and El Camino Real in San Mateo. If you have traveled much on BART, visited banks in the Bay Area, or driven out Geary Boulevard towards the City's Ocean Beach, you've seen the work of Alfonso Pardiñas. But it's unlikely you've ever heard of this once-widely admired but now-forgotten master of mosaics, who died much too young, four decades ago, in mysterious circumstances. From the mid-1950s to the day of his sudden death 20 years later, Pardiñas was at the center of San Francisco's Bohemian scene, palling around with such artists as local luminaries Benny Bufano and Jean Varda, with whom he collaborated, and architects for whom he worked, including Bob Anshen and Steve Allen, who designed homes for Joe Eichler. 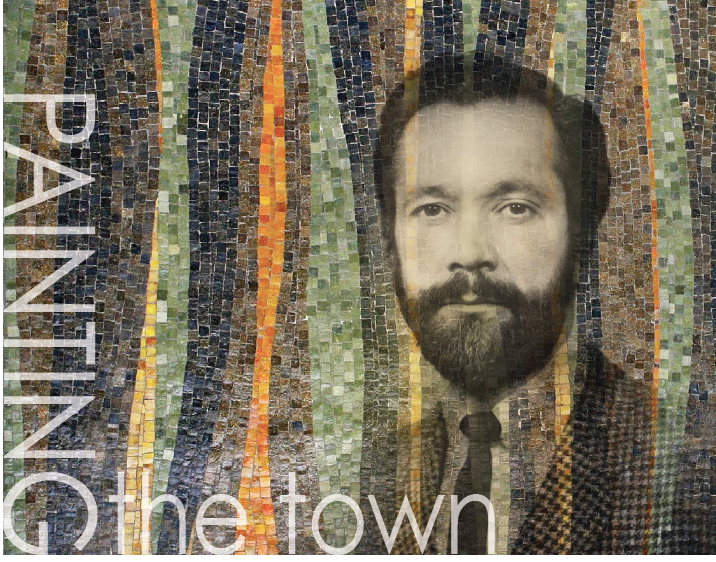 His firm Byzantine Mosaics slathered tiny glass tiles in intricate patterns both representational and abstract across bank exteriors, office lobbies, restaurants, private homes, and more throughout the Bay Area, reaching down to Southern California, and even east to Chicago and New York. Besides running his own firm, Pardiñas served as a salesman and broker on large jobs for Mosaicos Venecianos de México, a Mexican firm that produced a unique type of mosaic tile and had a factory of 80 people that assembled them into murals and other works. These included the works of Pardiñas. For a time Pardiñas had offices in Los Angeles and Mexico City as well as San Francisco, supervising mosaic installations up and down the West Coast.